Sozvezdiya.ru - Astronomy Encyclopedia. E.
Eagle Nebula (Ml6) Bright cluster of recently formed stars and associated EMISSION NEBULA (HII region), catalogued by astronomers as NGC 6611 and IC 4703 respectively. The object lies in Serpens Cauda (RA 18h 18m.8 dec. —13°47'), near the border with Scutum. The Eagle Nebula contains the famous 'Pillars of Creation', fingers of dark nebulosity associated with ongoing star formation, imaged from the HUBBLE SPACE TELESCOPE in 1995. The nebula and cluster are about 6500 l.y. away. The Eagle Nebula has an apparent diameter of 35'X 28'. 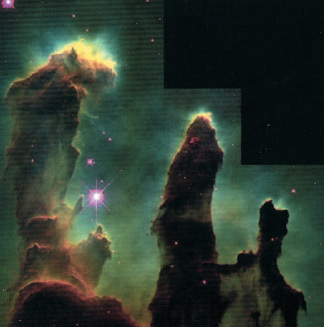 Eagle Nebula A European Southern Observatory image of the central part of the Eagle Nebula, showing the ‘Pillars of Creation’. These dark fingers of nebulosity are associated with continuing star formation. Earth Third planet from the Sun; the largest and most massive of the four TERRESTRIAL PLANETS and the only planet known to support life. Its mean distance from the Sun is defined as one ASTRONOMICAL UNIT, a convenient standard for the description of distances within the Solar System. Its orbit around the Sun defines the plane of the ECLIPTIC, to which the orbits of the other planets, minor planets and comets in the Solar System are referred. The intersection of the ecliptic with the celestial equator at which the Sun appears to move from south to north defines the FIRST POINT OF ARIES, the zero point for the determination of RIGHT ASCENSION. Earth En route to the Moon in 1972 December, the Apollo 17 crew obtained this photograph of an almost full Earth. Africa and the Indian Ocean are well presented in this view. The Earth has one natural satellite, the MOON, which is believed to have formed by ACCRETION in orbit of material ejected following the impact of a Mars-sized body with the proto-Earth. 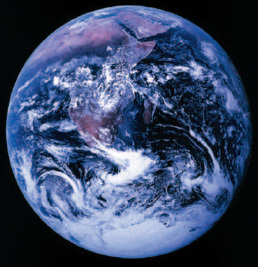 As a planet, Earth is distinguished by its abundant water, nitrogen-oxygen ATMOSPHERE, and its persistent and general geological activity, including continuing and widespread plate TECTONICS. MANTLE, which consists of iron- and magnesium-rich silicate materials in a semi-plastic state. Above the mantle is found the rigid LITHOSPHERE, which has two components, the outermost of which is a low-density CRUST. The crust consists of granitic continental rocks, extending to a depth of approximately 50 km (30 mi), and basaltic oceanic rocks, which are only 5-10 km (3-6 mi) in thickness. Denser lithospheric material underlies both continents and oceans to depths of approximately 100-200 km (60-120 mi) and 60 km (40 mi), respectively. The uppermost layer of the mantle, immediately below the lithos-phere, has a much lower viscosity than the rest of the mantle, and is known as the ASTHENOSPHERE. At the Earth's centre, the pressure is estimated to be approximately 4000 kbar and the temperature to lie within the range 5500-7500 K. (The uncertainty arises from difficulties in determining what elements may be present apart from iron and nickel.) The temperature of the liquid outer core is 4000-5000 K. This internal heat comprises residual heat from the original planetary accretion process together with heat produced by the radioactive decay of isotopes of elements such as uranium, rubidium and thorium. Radioisotope dating techniques suggest that the age of the Earth is approximately 4.5 X 109 years, slightly greater than the oldest dates established for lunar rocks (4.44 X 109 years). Because of Earth's level of geological activity, the greatest ages yet discovered are 4.276 X 109 years for zircon crystals from Australia, and 3.96 X 109 years for the Acasta gneiss from Canada. All these ages are exceeded by those found for some components of certain METEORITES, which predate the formation of the Solar System. The solid inner core rotates slightly faster (by c.0.66 second) than the rest of the planet, and it is this, together with motions in the liquid core, that generates the Earth's moderately strong magnetic field. The field is in the form of a magnetic dipole, the axis of which is inclined by c.110.5 to the planet's rotational axis. It has a field strength at the surface of c.0.3 gauss at the equator and approximately double this value at the magnetic poles. The magnetic field defines the Earth's MAGNETOSPHERE, and its interaction with the SOLAR WIND forms RADIATION BELTS (the VAN ALLEN BELTS) around the planet. The study of the palaeomagnetism fossilized in the crustal rocks indicates that the positions of the magnetic poles have migrated over geological time relative to the positions of the continents, and that there have been relatively regular reversals in the polarity of the field. Both of these effects, taken in conjunction with radioisotope dating, were instrumental in gaining acceptance of the theory of plate tectonics. The concept of continental drift was originally mooted by the Austrian meteorologist Alfred Wegener (1880-1930), who first lectured on the subject in 1912, but it did not gain widespread approval. The imprint of magnetic reversals in the basaltic rocks of the ocean floor allowed geophysicists to assess the rate and pattern of seafloor spreading, establishing that no part of the ocean floor was more than 200,000 years old, thus confirming the reality of plate motion. Plate tectonics explains how the Earth's crust consists of about twelve major lithospheric plates and numerous smaller ones, the majority of which are in constant motion relative to one another. These rigid plates move over the more fluid asthenosphere. Plate boundaries are of three kinds: divergent, where adjacent plates are moving away from one another; convergent, where they are colliding; and conservative, where adjacent slabs are sliding past one another. The boundaries between plates are marked by dynamic activities, such as seismic disturbances, volcan-ism, major faulting and, over long periods of time, by the creation of new mountain ranges. New oceanic crust is created at divergent boundaries or spreading centres, which are located at oceanic ridges and broader rises, such as the Mid-Atlantic Ridge and the East Pacific Rise. Hot basaltic magma rising from the Earth's mantle accretes on the edges of the diverging plates, which move laterally, creating new seafloor at rates that vary between 0.5 and 10 cm per year. The creation of new oceanic crust is largely balanced by destruction at a type of convergent boundary known as a subduction zone. A subduction zone is a steeply inclined belt where oceanic crust plunges beneath the adjacent plate, which may be of either continental or oceanic type. Complex processes occur at subduction zones; the subducting slab carries with it some of the overlying sediments and both are eventually melted at depth. Some of the sedimentary veneer is scraped off the plunging slab, and it accretes as highly deformed rocks on the edge of the overlying plate. Magma, generated by frictional heat and the increasing temperatures with depth, is less dense than the overlying rocks and penetrates the upper plate. At the edge of a continental plate this volcanic activity gives rise to major mountain ranges such as the cordilleran chains of North, Central and South America. When the overriding slab is of generally oceanic type, volcanically active island-arcs are produced, as in the Aleutian islands, Japan, Indonesia and New Zealand. Subduction zones are normally marked by deep oceanic trenches, and they are the sites of major earthquake activity, including deep-focus earthquakes occurring at depths as great at 700 km (430 mi). The majority of volcanic and earthquake activity on Earth occurs around the destructive margins of the 'Ring of Fire', which girdles the Pacific Ocean. Major mountain-building also occurs where two continental plates converge. The Himalayas and the high plateau of Tibet were raised by the collision of the Indian and Eurasian plates. They form part of the other major belt of volcanic and earthquake activity, which runs west through Central Asia and the Mediterranean. Improved seismographic techniques and analysis in recent years have provided considerable information about structures within the mantle. Cold subducting slabs may descend as far as the core-mantle boundary, where rising superplumes of hot mantle material originate. A continental plate that moves over a former subduction zone may be dragged vertically downwards by as much as 200-300 m (650-1000 ft). A continental plate above a superplume may be raised by a similar amount, as is occurring at present under southern Africa. Superplumes are also thought to be responsible for generating major and prolonged volcanic activity, such as that exhibited by the Deccan traps, the Siberian volcanic province and the Columbia River flood basalts. The Earth's climate is determined by a number of factors. The overall pattern is set by the differing intensities of insolation at different latitudes. The resulting temperature differences set up pressure gradients, which in turn generate the complex atmospheric circulation. The latter is a principal factor in the oceanic circulation, although temperature and salinity gradients are also involved. Because the oceans act as a heat reservoir, they exert a great influence over decade-long changes in weather and climate. Over the course of geological time there have been significant changes in the Earth's climate, most notably shown by recurrent periods of major glaciation, or ice ages, as well as periods of widespread warmth. Plate tectonics has played a major part in initiating some of these climatic changes, because of its effects upon the oceanic circulation and the distribution of land masses at high or low latitudes. The immediate cause, however, appears to have been fluctuations (as well as secular change) in the CO2 concentration in the atmosphere, with astronomical factors (such as variations in the eccentricity of the Earth's orbit, changes in inclination to the ecliptic, alterations in the timing of perihelion through precession, and possible changes in the solar constant) acting as the principal forcing mechanisms for cyclic change. earthshine Illumination by sunlight reflected off the surface and atmosphere of the Earth of that part of the Moon's disk that is in shadow. The effect is best observed eitherjust before or soon after new moon, when the faintly illuminated unlit area can be seen nestling in the thin, brightly lit crescent, a phenomenon popularly described as 'the old moon in the new moon's arms'. As the illuminated portion of the lunar disk increases in size the earthshine becomes too faint in comparison to be detected. At the same time, the phase of the Earth, as seen from the Moon, is shifting from full to gibbous, meaning that less light is reflected from it. eccentric Point introduced by Ptolemy to improve the description of planetary orbits. It is the centre of the deferent circle, but is near the Earth, not coincident with the Earth as in earlier geocentric systems (see ptolemaic system). eccentricity (symbol e) One of the orbital elements; it describes the degree of elongation of an elliptical orbit. The eccentricity is obtained by dividing the distance between the foci of the ellipse by the length of the major axis. A circular orbit has e = 0; a parabolic orbit is the extreme case of an ellipse, with e = 1.
echelle grating High-dispersion diffraction grating that produces spectra with a high degree of resolution over a narrow band of wavelengths. Like a standard diffraction grating, an echelle grating uses a number of parallel grooves ruled on its surface to disperse light into a spectrum. The difference with an echelle grating is that these grooves are stepped and their spacing relatively wide. Light is directed on to the grating at a large angle, producing a number of high-resolution overlapping spectra. These are then separated by a second, lower dispersion grating or a prism. Echelle gratings are used in echelle spectrographs. eclipse Passage of one body through the shadow cast by another. A lunar eclipse, where the Moon passes through Earth's shadow, is a good example. The Galilean satellites undergo eclipses in Jupiter's shadow: at certain times, twice in a jovian year, the orbits of the satellites align with the Sun such that one may eclipse another. Strictly speaking, a solar eclipse is an occultation, and the Moon's shadow covers only a relatively small part of the Earth's surface. eclipse year Interval of 346.62 days, which is the time between successive passages of the Sun through a node of the Moon's orbit. Eclipses can only occur when the Sun and Moon are aligned at the node. The eclipse year is shorter than the sidereal year of 365.25 days because the nodes move westwards (regress) by about 19° per year. A saros contains 19 eclipse years. eclipsing binary Subset of the close binary star systems - binary stars whose separation is usually of the order of ten times, or less, the average size of the components. The likelihood of observing eclipses in binary systems is greatest when the mean separation of components is just a few times greater than the mean radius of the stars themselves. eclipsing binary The lightcurve (bottom) of an Algol-type binary can be accounted for by partial eclipses of each star by the other (top). At the deep primary minimum, the brighter, smaller star is largely covered by the fainter. When both stars are fully visible, light is at a maximum, while a less prominent secondary minimum occurs midway through the cycle as the brighter star passes in front of the fainter. The component stars of most classical eclipsing pairs have similar radii. The light from a system in which one star is very much larger than the other would tend to come predominantly from that large star, so that the eclipse of the small star (occultation), or its passage in front of the large star (transit), would tend to have an effect too small to be readily observed, unless that small star were relatively very bright (per unit surface area) compared to the large star. Eclipsing binaries undergo a regular cycle of variation in apparent brightness because their orbital motions take place in a plane that is oriented at a relatively low angle to the line of sight. For eclipsing binaries, the inclination is usually not far from 90°, and, in any case, greater than about 58°. There will be a succession of two alternating photometric minima - one a transit, the other an occulta-tion (unless the stars are exactly equal in size). Eclipses may be total, partial or annular. Because there are two stars in the system, two eclipses may be expected during the course of an orbital cycle, though it sometimes happens that one of these events causes so slight a loss of overall light from the system as not to be noticeable. The deeper eclipse minimum, associated with the eclipse of the brighter star, is usually called the primary minimum. The star so eclipsed would tend to be called the primary star, and, in practice, this star is very often the more massive. The shallower secondary minimum is associated with the eclipse of the secondary component. The components of most eclipsing binary systems revolve in orbits that are essentially circular. Elementary geometry will then show that the same effective area of stellar surface is eclipsed at both minima, and the minima are also of equal overall duration (for circular orbits). Since the eclipsed areas are equal at corresponding phases of either minimum, the ratio of depths in the minima at these phases is proportional to the brightness per unit area. The primary star is thus the star of greater surface temperature; though it is possible for the secondary, though cooler, to be bigger in size (the primary minimum would then be of occultation type), and actually to emit more light overall than the primary. This situation may be confusing when spectroscopy is being combined with photometry, in which case the spectroscopic primary (source of greater fraction of overall light) would then differ from the photometric primary (the hotter star). Eclipsing binary systems attract attention because their light-curves can be analysed to determine key parameters of great astrophysical significance. From such systems, information on the sizes, luminosities, surface temperatures, masses, and, to some extent, composition and structure of the component stars may be derived. 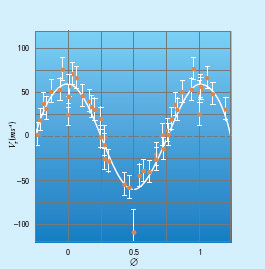 Such absolute parameters are not derived from a single monochromatic light-curve (though surface temperatures may be inferred from two such curves at different wavelengths), but if spectroscopic evidence is available on the system (such as the spectral type and spectral luminosity class of the brighter, or perhaps both components), then absolute values can be inferred. More powerful arguments are available when the radial velocity variations of one or both stars throughout the course of the orbit are known. As the use of the word 'eclipsing' suggests, however, it is the photometric evidence that tends to take precedence in the study of this class of object. Eclipsing binaries are classified into three basic types on the basis of their light-curves. Historically, these were described as the ALGOL type (EA), the BETA LYRAE type (EB), and the W URSAE MAJORIS type (EW). EA types have an essentially constant (to within 0.1 mag.) light level outside of eclipses, which are thus clearly defined (at least for the primary eclipse). EB-type light-curves show a continuous pattern of variability. The abrupt variations that mark out the eclipse regions are still distinct, but proximity effects render the regions outside the minima (sometimes called 'shoulders') markedly curved. EW systems show more or less equal depths of primary and secondary minima. In EW light-curves proximity effects show such a scale of variation as to merge smoothly into the eclipse minima, which can no longer be clearly discerned. The proximity effects are explained in terms of two basic types of interaction - the reflection effect and gravitational interactions. Both effects increase with reduced separation of the components. As well as classification based on light-curve morphology, schemes have been proposed that are influenced by the physics or evolution of the stellar components. A common scheme classifies eclipsing binaries into detached, semidetached and CONTACT BINARY systems, based on the relationship of the member stars to the ROCHE LOBE. If a binary component were to expand beyond this limiting surface, a dynamical instability of some kind would ensue. The detached systems are generally seen as unevolved, each star lying fully within its own Roche lobe. Probably the most frequently observed type is the semidetached kind, of which Algol may be regarded as typical. In these systems the secondary is very close to or in 'contact' with its surrounding Roche lobe. Physical Algol-type close binary systems do not always correspond with the EA-type light-curves: the physical Algols show light-curves that are actually a subset of the EA kind. The contact binaries are characterized by both stars filling their Roche lobes; they would thus be in contact with each other. It is now thought that these binaries, which, as a class, coincide closely with systems showing the EW-type light-curve, overflow beyond their common (inner) Roche limiting volume into a surrounding common envelope. In addition to these major groupings, there are various smaller subgroups. Some DWARF NOVA systems exhibit eclipses, and the special geometrical circumstance may be particularly revealing on physical properties. In a more extreme physical condition are the X-RAY BINARIES; the eclipse effect may sometimes affect the X-ray radiation itself, thus providing insight into the geometrical arrangement of the components. Though there is no definitely established case of an eclipsing binary member of a globular cluster, eclipsing systems have been observed in the MAGELLANIC CLOUDS. In principle, they offer the means of comparing stellar properties, in a direct way, over very large reaches of space. About 6000 eclipsing binary systems are known, including many that also exhibit other forms of variability. ecliptic Apparent yearly path of the Sun against the background stars. Caused by the Earth's orbital motion, the ecliptic is really a projection of the Earth's orbital plane on to the CELESTIAL SPHERE and, because of the tilt of the Earth's axis, is inclined to the CELESTIAL EQUATOR at an angle of approximately 23°.5, which is known as the OBLIQUITY OF ECLIPTIC. The celestial equator intersects the ecliptic at two points on the celestial sphere, the FIRST POINT OF ARIES and the FIRST POINT OF LIBRA, also sometimes referred to as the EQUINOXES. The ecliptic poles lie 90° from the ecliptic, in the constellations of DRACO and DORADO. The annual path of the Sun takes it through the familiar 12 constellations of the zodiac, but the effects of PRECESSION, together with re-definitions of constellation boundaries, mean that the ecliptic now also passes through the constellation of OPHIUCHUS. The apparent paths of the planets also closely follow the ecliptic since the planes of their orbits are only slightly inclined to that of the Earth. The name 'ecliptic' derives from the fact that eclipses of the Sun or Moon can only take place when the Moon passes through this plane. ecliptic coordinates System of locating points or celestial objects on the CELESTIAL SPHERE using the ECLIPTIC as the plane of reference and the measures of CELESTIAL LATITUDE and CELESTIAL LONGITUDE (also known as ecliptic latitude and ecliptic longitude). Celestial latitude is measured in degrees from the ecliptic (0°) in a positive direction to the north ecliptic pole (+90°) and a negative direction to the south ecliptic pole (—90°). Celestial longitude is measured around the ecliptic from 0° to 360°, eastwards of the FIRST POINT OF ARIES, the intersection of the ecliptic with the celestial equator. ecliptic limits Greatest angular distance around the ECLIPTIC that the new moon or the full moon can be from the Moon's nodes for an ECLIPSE to take place. The limits are 18°.5 for the new moon at a SOLAR ECLIPSE, and 12°.2 for the full moon at a LUNAR ECLIPSE. E corona Extended form of the solar CORONA. It is produced by interactions of ions with electrons and protons, and radiation from the PHOTOSPHERE, which result in production of EMISSION LINES. The E (emission line) corona is present in the visible part of the spectrum, where about 20 emission lines are present, and also at short, ultraviolet and X-ray wavelengths. ecosphere Spherical region around a star, also known as the circumstellar habitable zone (CHZ), within which life can exist. Its inner and outer limits may be set at those distances from the star at which the effective energy flux is respectively ~1.2 and ~0.4 times the present value of the solar flux at Earth's orbit (1360 W/m2). This range is determined by the tolerance of known forms of terrestrial life and the extremes of the Earth's surface BIOSPHERE; it applies only to a planetary body of suitable mass and chemical composition (similar to the Earth's) that orbits entirely within the ecosphere. For some subsurface micro-organisms (see LIFE IN THE UNIVERSE), the limiting radii of the Solar System ecosphere extends from ~0.4 to ~40 AU, a zone almost 75 times wider than the ecosphere. In general, the limiting radii of the ecosphere for a planetary system depend on the luminosity and surface temperature of the primary star. For the Sun, a main-sequence G-type dwarf, the present ecosphere extends from just inside the Earth's orbit to just within the orbit of Mars. The width and distance of the ecosphere changes over time with the evolution of the star. The luminosity of the Sun is steadily increasing, and the limits of the ecosphere are migrating outwards. A star more massive and hotter than the Sun will have a larger and wider ecosphere, while a less massive and cooler star will have a smaller and narrower one. Eddington, Arthur Stanley (1881-1944) English astrophysicist known for his advocacy of Einstein's general theory of relativity and his discovery of the MASS-LUMINOSITY RELATION. In 1905 he joined the ROYAL GREENWICH OBSERVATORY, where he successfully reduced photographic observations of the asteroid Eros to obtain a more precise calculation of the SOLAR PARALLAX. Eddington used statistical methods to discover the distribution of stars in the Milky Way and their motions. In 1913 Cambridge University named him Plumian Professor of Astronomy, and the next year he was appointed director of Cambridge Observatory. Eddington soon became interested in Einstein's theory of GENERAL RELATIVITY and its prediction that light rays would be deflected in a gravitational field. The best test of this theory was to observe a total eclipse of the Sun, the nearest body possessing a massive gravitational field. If the positions of stars that appeared very close to the Sun's limb during an eclipse were altered slightly from their 'normal' positions as observed when the Sun was nowhere in their vicinity, this would prove Einstein's theory. For the 1919 total solar eclipse, Eddington organized an expedition to the West African island of Principe and obtained several photographic plates of stars near the solar limb. Back in England, he announced that careful measurement and reduction of these stars' positions confirmed the predicted bending of sunlight. Eddington's greatest contributions were to the theory of energy production in stellar interiors and stellar evolution, summarized in his classic book The Internal Constitution of the Stars (1926). He discovered (1924) that for main-sequence stars there exists a linear relationship between their absolute bolometric magnitudes (a function of the logarithm of the star's luminosity) and the logarithms of their masses. Eddington correctly modelled the abundance of hydrogen in solar-type stars, and evolved a theory to explain how cepheid variable stars pulsate. Edgeworth-Kuiper belt (outer asteroid belt) Broadly planar zone, stretching from the orbit of Neptune at 30 AU out to about 1000 AU, populated by a substantial complex of planetesimals currently classed as asteroids. The existence of this band was proposed on theoretical grounds by Kenneth Edgeworth (1880-1972) in 1949 and independently by Gerard kuiper in 1951. The basis of their idea was that a vast number of comets or planetesimals must have formed in the outer Solar System from the solar nebula and that they should persist beyond Neptune, never having accreted to produce a fully fledged planet. The concept was resurrected in the 1980s as an explanation of the origin of short-period comets: such a belt could explain the generally low orbital inclinations of such comets, whereas the spherical oort cloud model could not. Recently it has been realized that in the 1930s Frederick Leonard (1896-1960) had put forward similar ideas to those of Edgeworth and Kuiper. Edgeworth–Kuiper belt A pair of Hubble Space Telescope images showing a faint, distant comet nucleus (circled) a few kilometres in diameter in the Edgeworth–Kuiper belt beyond the orbit of Neptune. The first member of the belt was discovered in 1992. Through to late 2001 more than 500 objects had been found in this region. Their sizes are mostly in the range of 100 to 500 km (60 to 300 mi), although larger bodies exist, for example varuna. There is no reason to believe that there are not also many smaller members of this belt. Members of the Edgeworth-Kuiper belt are often called trans-neptunian objects (TNOs). Many of them have been found to occupy the 2:3 resonance against the orbital period of Neptune, as does Pluto, and these are collectively termed plutinos; other resonant orbits also exist. Other TNOs, following semi-random orbits, are often termed cubewanos. Although categorized as asteroids in terms of their naming and cataloguing, members of the Edgeworth-Kuiper belt are thought to be similar to comets in terms of their physical nature. Their spectral reflectivities show them to be reddish, continuing the trend seen from the inner border of the main belt of asteroids through to its outer edge, and then through the region of the giant planets. Edge-worth-Kuiper belt objects do not show comet-like activity because they are at such huge distances from the Sun. If they leak inwards into planet-crossing orbits they may become centaurs, in which case cometary outgassing can begin to occur, as observed in the case of chiron. It is thought likely that Neptune's moon triton and many of the small outer satellites of the giant planets may have begun their lives in this belt. 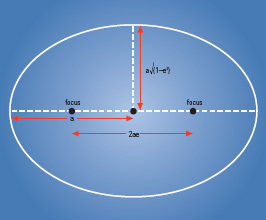 effective focal length Working focal length of an optical system that uses several elements to bring light to a focus; the quantity comes into play when, for example, eyepieces are used to increase the image scale of an instrument. effective temperature Temperature of an object found by assuming that its total emission over all wavelengths is that of a black body. The temperature is obtained using the stefan-boltzmann law. It is similar to the radiation temperature, except that the latter uses the emission from the object at a particular wavelength, or over a small wavelength region, and hence the Planck equation (see planck distribution). Egg Nebula (CRL 2688) Young planetary nebula in the constellation cygnus, near e (RA 21h 02m.3 dec. + 36°42'). The Egg Nebula may be less than 500 years old. Images from the hubble space telescope show multiple arcs of material in shells surrounding the central star, indicating that mass ejection during planetary nebula formation is episodic. The Egg Nebula lies at a distance of 3000 l.y. Egyptian astronomy Astronomy as practised by the ancient Egyptians, until the time of the Persian conquests in the first millennium bc. Although there are historical records dating back to around 3000 bc, there is no evidence that the Egyptians attained the technical level of babylonian astronomy. With a less developed geometry and number system, their knowledge of celestial motions was inferior. They did, however, possess a complex pantheon of deities that was closely linked to their constellations and creation myths, and solar rituals. As in other ancient cultures, the main reason for making astronomical observations was to keep track of the passing of the year and the hours of day and night. Their agriculture depended on the annual flooding of the Nile, which deposited a layer of silt that fertilized the land. This annual event of vital importance had to be predicted, but the original Egyptian calendar was based on a fixed number of lunar months, and soon became out of step with the solar year. The calendar was reconciled with the true solar year by observing the heliacal rising of Sirius (then called Sothis), which heralded the flooding of the Nile. If a heliacal rising occurred in the 12th month, an extra, intercalary month was added, the first time in history that such a step was taken. By perhaps as early as 3000 bc, the year had been standardized to 365 days, and 12 months of 30 days were each divided into three weeks of 10 days. With each week was associated one of 36 small constellations whose heliacal risings were separated by about 10 days. During the course of an average night (excluding twilight periods), 12 of these constellations were observed to rise, leading to the division of the night into 12 hours. Daytime was likewise divided into 12 hours, and thus arose the 24-hour clock. The passage of time during the day was marked by a T-shaped gnomon, or shadow stick; later, in the 14th century bc, the clepsydra, or water-clock, was invented. That the Egyptians were accomplished observers and surveyors is evident from the construction of pyramids and temples, some of which are aligned north-south to an accuracy of a few arcminutes. Several of the pyramids, including the Great Pyramid at Gizeh, have long, narrow shafts angled to the horizontal, which have been conjectured to align on certain stars at their culmination. Einstein, Albert (1879-1955) German-American theoretical physicist who gained worldwide fame for his theories of special relativity and general relativity linking matter, space and time, which had a profound effect on cosmology. At school and college, he showed no special aptitude; Hermann minkowski, one of his professors at the Technische Hochschule at Zurich, later expressed his astonishment that such an ordinary student had become a genius. Einstein became a Swiss citizen in 1901 and, while working at the Patent Office in Bern, explained the photoelectric effect by using Max planck's radiation law to describe light in terms of 'quanta', discrete bundles of energy, later called photons. For this work, Einstein was awarded the 1921 Nobel Prize for Physics. In 1905 Einstein introduced his theory of special relativity, which held that the velocity of light in a vacuum is constant and that the laws of physics must remain the same in all inertial reference frames. The special theory described space and time as inseparable entities (which he called spacetime), predicting the phenomena of time dilation for bodies moving at velocities near that of light and the Lorentz contraction, whereby such an object will appear foreshortened in the direction of its relativistic motion. From the special theory, Einstein derived his famous formula E = mc2 to describe the relation between energy and relativistic mass. By 1909 he was gaining recognition as a leading theoretical physicist, and he became a professor of physics at the University of Zurich. His fame in the international scientific community spread, and in 1914 he was appointed director of the Kaiser Wilhelm Institute, Berlin. Einstein's theory of general relativity, first published in 1915, introduced the gravitational equivalence principle - that gravitational fields and uniform acceleration were equivalent. This concept, which defined gravitational fields as the warping of spacetime by massive objects, predicted that a massive body like the Sun would produce a gravity field capable of slightly deflecting the paths of light from stars near the solar limb. The best way of testing this prediction was to observe such stars during a total solar eclipse, and in 1919, eclipse expeditions led by Arthur eddington and others confirmed this effect. The effects of the curvature of space are most evident for the large-scale structure of the Universe, which led Einstein to apply general relativity to cosmology; he developed a model of a finite but unbounded universe, introducing the concept of a cosmological constant. From this time onwards, his main scientific interest was an unsuccessful quest for a unified field theory linking gravitation and electromagnetism. Relativity made Einstein world-famous, a media star like no other scientist before or since, his face a 20th-century icon. As a Jew, Einstein found conditions in Germany intolerable after Hitler's accession in 1933, and he remained in the USA, where he had been visiting Caltech. He became the first professor at Princeton University's Institute for Advanced Study, where he remained for the rest of his life, taking US citizenship in 1940. With an angular resolution of 4", this satellite revolutionized x-ray astronomy. Operational for two and a half years, it detected thousands of new X-ray sources. Its observations confirmed that almost all types of stars emit X-rays. Knowledge of the X-ray properties of quasars was greatly enhanced by the Einstein Observatory, while its observations of numerous galactic clusters transformed our view of these extended X-ray sources. Einstein ring Distorted image of a distant light source, seen around a gravitational lens. Einstein's theory of general relativity predicted that rays of light should bend in a gravitational field, thus allowing nearby objects to focus the light of more distant objects. In the special case where the source is directly behind the lensing object, its light is spread out into a ring. In practice, perfect rings are rare, though incomplete rings - arcs - are commonly seen through galaxy clusters. Einstein ring A Hubble Space Telescope image of B1938 +666, in which a foreground galaxy behaves as a gravitational lens. Light from a more distant galaxy is seen as an almost perfect ring surrounding the lensing object. ejecta Material, such as ash, lapilli and bombs, that is violently thrown out during the eruption of a volcano. Also the impact debris and sometimes impact melt that is ejected in the process of impact crater formation. Volcanic ash may be distributed by atmospheric currents up to hundreds or thousands of kilometres from the source. Lapilli and bombs fall in the neighbourhood of the eruption vent. Excavated material forms a concentric ejecta blanket around an impact crater, typically composed of the crushed target rocks with a minor admixture of impactor material. Impact-melted target material is significant in the ejecta from large impact craters. On Mars, ejecta from many impact craters show morphologic evidence of flow after they landed on the surface; they are known as fluidized ejecta. This flow is caused by the presence in the target of ice and water, which lubricate the ejecta and enable it to flow like a mud. On Venus many craters show the presence of ejecta outflows. These radar-bright flows originate within blocky and hummocky ejecta blankets. Ejecta outflows are believed to be flows of superheated impact melt and/or the fine-grained fraction of ejecta debris suspended in Venus' dense atmosphere. ejecta Material thrown out during the formation of the lunar crater Copernicus blankets the surrounding Mare Imbrium. The ejecta is well shown in this oblique-angle Lunar Orbiter 5 image. Elara One of the small satellites in jupiter's intermediate group, discovered by Charles Perrine (1867-1951) in 1905. Elara is about 76 km (47 mi) in size. It takes 259.6 days to circuit the planet, at an average distance of 11.74 million km (7.30 million mi) from its centre. It has a substantial inclination (near 27°) and moderate eccentricity (0.217). Although Elara has the same orbital period as lysithea, their differing orbital characteristics mean they are not usually regarded as being co-orbiting satellites in the same way as are other closer, dynamically well behaved, satellites of the giant planets. It seems likely that this pair originated through the break-up of a larger captured body that also spawned leda and himalia. E-layer One of the distinct layers within the Earth's ionosphere where the density of free electrons is higher than average. It is more correctly described as a region, because it lies between 90 and 150 km (about 60-90 mi) above the Earth's surface. It is present during the daytime, but recombination occurs at night and the layer weakens or disappears. Radio waves of sufficiently low frequency are reflected by the E-layer. Sometimes, a poorly understood phenomenon known as Sporadic-E occurs, principally in the months of May to August for the northern hemisphere. This effect causes VHF radio waves with frequencies up to 200 MHz to be reflected. The theory of electromagnetic waves was developed by James Clerk MAXWELL, who deduced that an oscillating charged particle would emit a disturbance that would travel through the electromagnetic field at the speed of light. He identified light as a form of electromagnetic radiation. Electromagnetic radiation is a transverse wave motion, vibrating perpendicularly to the direction of propagation, like the wave in a guitar string. The distance between successive wave crests is the wavelength, and wavelengths range from less than 10~14 m (for the shortest gamma rays) to kilometres or more (for the longest radio waves). The number of wave crests per second passing a fixed point is the frequency. The relationship between wavelength (X), frequency (f or v) and the speed of light (c) is Xf = c.
High frequency corresponds to short wavelength and low frequency to long wavelength. The unit of frequency is the hertz (Hz), where 1 Hz = 1 wave crest per second. Thus a wavelength of 1 m is equivalent to a frequency of 3 X 108 Hz; a wavelength of 1 nm is equivalent to 3 X 1017 Hz, and so on. Electromagnetic radiation may be polarized. The state of POLARIZATION describes the orientations of the vibrations. An unpolarized beam consists of waves vibrating in all possible directions perpendicular to the direction of propagation, while a plane-polarized beam consists of waves vibrating in one plane only. In circularly polarized radiation the direction of the vibration rotates at the frequency of the radiation as the wave moves along, while in elliptically polarized radiation, the direction and the amplitude of the vibration change. where h is PLANCK'S CONSTANT. Thus the shorter the wavelength (or the higher the frequency), the greater is the energy of the photon. Gamma rays and X-rays have the highest energies while radio waves have the lowest energies. Light and other forms of electromagnetic radiation exhibit wave properties in some circumstances (see REFRACTION, INTERFERENCE and DIFFRACTION) and particle properties in others, notably the photoelectric effect. Electromagnetic radiation is emitted or absorbed by many processes, and the ones that predominate vary according to the wavelength regions. Thermal radiation is produced at all wavelengths, but the peak of the emission depends upon the temperature (see WIEN'SLAW). As a reasonable generalization, for the radio region there is direct interaction with electric currents, FREE-FREE RADIATION and SYNCHROTRON RADIATION, in the microwave and infrared, the interaction is with rotating and vibrating molecules, in the optical and ultraviolet it is with electrons in atoms and molecules, while at the shortest wavelengths the interaction is directly with nuclei. electromagnetic spectrum Complete range of ELECTROMAGNETIC RADIATION from the shortest to the longest wavelength, or from the highest to the lowest energy. Although there is no fundamental difference in nature between, say, X-rays and radio waves, the complete range of wavelengths has been divided into a number of sections. The principal divisions (and their approximate wavelength regions) are gamma rays (less than 0.01 nm), X-rays (0.01-10 nm), ultraviolet (10—100 nm), visible (400-700 nm), infrared (700 nm-1 mm), microwaves (1 mm-0.3 m) and radio waves (greater than 0.3 m). Further subdivisions that may be encountered include hard X-rays, soft X-rays, EXTREME-ULTRAVIOLET (EUV), NEAR-INFRARED, middle-infrared, FAR-INFRARED, submillimetre and millimetre wave. electromagnetic spectrum Spanning from short, gamma-ray wavelengths to longwavelength radio emissions, the electromagnetic spectrum covers a wide range. Selection of appropriate wavelengths allows different processes and classes of objects to be observed. The visible region comprises only a tiny part of the electromagnetic spectrum. The Earth's atmosphere prevents most wavelengths from penetrating to ground level. Gamma rays, X-rays and the great bulk of ultraviolet radiation are absorbed at altitudes of tens or even hundreds of kilometres, where they excite atoms and molecules, dissociate (break them apart) or ionize atoms or molecules (expel electrons from them). Radiation of between about 300 nm and 750 nm can penetrate readily to ground level and this range of wavelengths is termed the 'optical window'. Water vapour and carbon dioxide are the major absorbers of infrared radiation, but there are a few narrow wavebands at which infrared can penetrate to ground level or, at least, to mountain-top observatories, notably at around 2.2, 3.5 and 10 |jum (see infrared astronomy). In the far-infrared there are no atmospheric windows, but a small proportion of submillimetre and millimetre wave radiation can penetrate to high-altitude sites. Radiation in the wavelength range from about 20 mm to nearly 30 m can penetrate to sea level, and this spectral band is referred to as the radio window. Waves longer than 30 m are reflected back into space by the ionosphere. electron volt (symbol eV) Non-SI unit of energy. It is defined as the energy gained by an electron when accelerated by a voltage of 1 volt. 1 eV = 1.602 X 10~19 J. It is often a convenient unit for the energies of photons and subatomic particles. Thus the visible spectrum ranges from photons with an energy of 1.8 eV (red) to 3.6 eV (violet). electroweak force Part of the grand unified theory (GUT) of the fundamental forces. Elementary particle theory suggests that in the early universe when the temperature was near 1015 K the electromagnetic force separated from the weak force and they became distinct independent forces. element Substance that cannot be broken down into simpler substances by chemical means. An element is composed solely of atoms with identical atomic numbers (that is, they all have the same number of protons within their nuclei), but it may contain a number of different isotopes. So far 107 elements have been identified, and 90 of the 92 so-called naturally occurring elements have been found in nature, either free, for example copper (Cu), iron (Fe), gold (Au) and sulphur (S), or combined with other elements, for example silicon dioxide (SiO2) and calcium carbonate (CaCO3). The missing two are tech-netium, identified in the cyclotron transmutation products of molybdenum in 1937, and promethium, isolated in 1945 from nuclear fission products. The remainder have been synthesized by nuclear bombardment or fission. The elements fall into three classes according to their physical properties: metals, non-metals and metalloids. Metals are the largest class and are physically distinguished as malleable, ductile, good conductors of heat and electricity, have a high lustre, a close-packed arrangement of atoms, and are usually strong. Non-metals are abundant in Earth's crust and are important biologically. Generally they are poor conductors of heat and electricity, brittle, hard, lack lustre, and have very high melting points. This class though does also include the noble gases (helium, neon and so on). Elements included in the metalloids are boron, silicon, germanium, arsenic, antimony, and tellurium; they have both metallic and non-metallic properties. elementary particle Subatomic particles that are thought to be indivisible. Atoms that make up ordinary matter are not the smallest indivisible units of mass. Each atom can be divided up into parts called electrons, protons and neutrons. These smaller, more elementary particles can be arranged to explain all known elements. It was eventually noticed that protons and neutrons were not truly elementary either, but were made up of still smaller particles called quarks. We now know that there are dozens of elementary particles, so many that particle physicists call it the 'particle zoo'. The study of elementary particle physics endeavours to classify and understand all of the known particles, including massless particles like photons. The table lists all of the families of elementary particles known. Some underlying theory must be able to explain the existence and interactions of all of the known elementary particles. The quantum theory was devised to try to explain all of the known elementary particles and their interactions and fields. As work on the quantum theory progressed, more detailed treatments of the various particles and the discovery of new particles necessitated a revision of the standard quantum interpretation. The standard model linked the electromagnetic force with the strong force and explained many of the particles and their various interactions. Later theories like supersymmetry attempted to combine the standard model with the weak force to form a grand unified theory (GUT). A more sophisticated theory that would link the final force, gravity, to the three GUT forces is sometimes called the theory of everything (TOE). ellipse The principal features of an ellipse are its two foci, its semimajor axis (a), its short (minor) axis and its eccentricity (e). In the case of an ellipse used to define a planetary orbit, the Sun occupies one of the foci while the other is empty. The planets’ orbits are reasonably close to circular, but for most comets the orbital ellipse is extremely eccentric, with a very long major axis. ellipsoid Three-dimensional 'egg-shaped' geometrical figure. Mathematically, it is defined as a closed surface whose cross-sections are ellipses or circles. An ellipsoid has three semi-axes: a semimajor axis (a), a semimean axis (b) and a semiminor axis (c), all at right angles to one another. Generally they will be of different lengths (a > b > c). If all are equal, the figure is a sphere. If b = c the figure is called a prolate spheroid. If a = b it is an oblate spheroid. 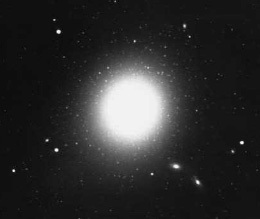 An elliptical galaxy is an ellipsoid. A close satellite of a planet is distorted by rotational and tidal forces into a Roche ellipsoid, with the longest axis aligned towards the planet and the shortest in the direction of its orbital pole. A rapidly rotating self-gravitating body may be distorted into an equilibrium figure called a Jacobi ellipsoid. 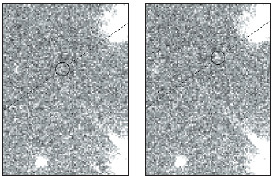 The properties of ellipsoids have been important in the study of the shape and evolution of elliptical galaxies. Ellipsoidal components are found in various optical systems. ellipsoidal variable (ELL) Close binary star system, the components of which are almost in contact, but non-interacting, with the result that they are distorted to non-spherical shapes. Eclipses do not occur, because of the orbital inclination to the line of sight, but variations in the projected area of the stars produce variations in the overall magnitude. Periods are less than one day, with ranges in magnitude of less than 0.8. Such stars are of spectral type F to G.
elliptical galaxy Galaxy that is elliptical in observed shape. Elliptical galaxies are generally composed of only old stars, with little dense gas available for additional star formation. Dynamical measurements show that many are triaxial, geometric figures with different radii along each axis, and thus their shapes reflect the distribution of stellar orbits rather than being produced by a net rotation. In the hubble classification, ellipticals are described according to apparent shape, from E0 for circular images to E7 for the most flattened ellipticals. Elliptical galaxies span a vast range in size and luminosity, from 100 million stars in a dwarf elliptical to 10 million million in the largest giant ellipticals. elliptical galaxy M87 (NGC 4486) is a giant elliptical galaxy in Virgo. Such objects are usually the largest in galaxy clusters and have probably consumed other, smaller galaxies by cannibalism. ellipticity (oblateness) Measure of the amount by which an ellipse deviates from a circle or by which a spheroid deviates from a perfect sphere. It is defined as the ratio of the difference between the major (longer) and minor (shorter) axes of an ellipse to the length of the major axis, or in the case of a sphere, the ratio of the difference between the equatorial and polar radii of a body to its equatorial radius. The ellipticity of a celestial body is an indicator of its speed of rotation because the faster it spins, the more it 'bulges' at the equator. Elnath Alternative form of alnath, the name of the star P Tauri. Eltanin Alternative spelling of etamin, a name given to the star y Draconis. Elysium Fossae Aligned valleys crossing the flanks of Elysium Mons on mars (24°.8N 213°.7W). embedded cluster Group of stars in the process of formation, still embedded within the interstellar medium from which they formed. These embedded clusters can be detected best in the infrared because the material surrounding them is opaque at other wavelengths. emersion Re-emergence of a star or planet from behind the Moon's trailing (westerly) limb at an occultation. The term may also be used to describe the Moon's exit from Earth's umbra at a lunar eclipse. emission nebula Generic term for any self-luminous interstellar gas cloud. The term embraces supernova remnants, planetary nebulae and hii regions. The emitted radiation is normally taken to be in and around the visible region, thus dark nebulae and reflection nebulae are not included in the term even though they do emit microwave and radio radiation. emission nebula The Lagoon Nebula, M8, in Sagittarius is a classic example of an emission nebula. The Lagoon shows strong HII emission, stimulated by ultraviolet radiation from young stars forming in its midst. emission spectrum Spectrum that contains emission lines. A hot solid or high-pressure gas emits a continuous spectrum at wavelengths that depend on temperature. A hot, low-density gas produces emission lines that may or may not be superimposed on a continuum. Emission spectra are produced by the solar corona, certain stars, planetary and diffuse nebulae, quasars and other objects. Depending on temperatures and physical processes, they are seen in the range from gamma rays to radio waves. Emission spectra can be used to determine densities, temperatures, velocities and chemical compositions. Enceladus Small spherical satellite of saturn. It was discovered by William herschel in 1789. It is similar in size to its inner neighbour, mimas, but in other ways it could hardly be more different. Mimas has an old, heavily cratered surface, whereas Enceladus shows abundant signs of a prolonged active geological history. On images sent back by voyager 2 in 1981, some apparently craterless (and therefore very young) regions are smooth, while other craterless tracts are traversed by sets of curved ridges, which may be cryovolcanic extrusions (see cryovolcanism). Elsewhere, the crater density varies greatly from one region to another, but even the most densely cratered areas have only about the same density of craters as the least cratered areas on Saturn's other satellites. Parts of some old craters at terrain boundaries have been obliterated, probably by cryovolcanic resurfacing processes. Enceladus has clearly experienced several periods of activity, presumably powered by tidal heating. Enceladus A composite Voyager 2 view of Saturn’s satellite Enceladus. While heavily cratered in some regions, the surface of Enceladus has also been smoothed over by episodes of cryovolcanism. Enceladus is currently in a 2:1 orbital resonance with the next-but-one satellite out, dione, and in a 1:2 orbital resonance with the small co-orbital satellites janus and epimetheus, the orbits of which lie within that of Mimas. Despite these orbital resonances, Enceladus probably experiences very little tidal heating today because the eccentricity of its orbit is currently too slight. However, its orbital eccentricity is likely to vary cyclically over tens or hundreds of millions of years, which could account for the multiple episodes of resurfacing that have left their traces on the surface of this remarkable satellite. 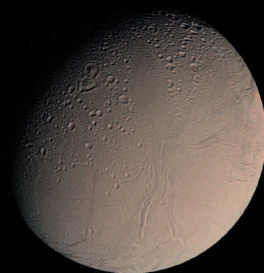 Enceladus has a brighter surface than any other icy satellite, giving it an albedo of virtually 1. This brightness could be caused by cryovolcanic frost distributed across the globe by explosive eruptions. Alternatively, it could be a result of continual impacts on to the surface by particles from Saturn's outermost ring (the E ring), within which the orbit of Enceladus lies. See data at saturn Encke, Johann Franz (1791—1865) German astronomer, famous for calculating the orbit of the comet that bears his name. This comet had been observed in the 18th century by Pierre mechain and Caroline herschel, and in 1805 and 1818 by Jean-Louis pons. Pons suspected that his 'two' comets were actually the same object, and Encke's improved orbital calculations confirmed this suspicion. He also discovered the encke division in Saturn's rings. Encke supervised the building of the new Berlin Observatory, which he directed from 1825 to 1865. Encke, Comet 2P/ Short-period comet, first discovered as a naked-eye object by Pierre mechain in 1786. Comets discovered in 1795 by Caroline herschel, in 1805 by Jean Louis pons, J.S. Huth and Alexis Bouvard (1767—1843), and in 1818 by Pons again were shown by Johann encke in 1819 to be further returns of the same object. Encke's Comet returned as predicted in 1822. To 1999 the comet has been observed at 58 returns, which is far more than any other comet. Its orbital period of 3.3 years is the shortest for any periodic comet. Small changes in the orbital period result from non-gravitational force produced by gas ejected from the comet's nucleus. Modern detectors allow observation of 2P/Encke around its entire orbit. Encke Division Main division in Saturn's a ring; it was discovered by J.F encke. It is not a difficult feature to observe telescopically when the rings are suitably placed. The Encke Division's mean distance from the centre of Saturn is 133,600 km (83,000 mi). As with the cassini division, it is not empty but represents a zone where ring particles are few. This and the other divisions are controlled by gravitational perturbations by the satellites. Endeavour Name of the fifth space shuttle orbiter; it replaced the Challenger lost in 1986. Endeavour first flew in 1992. Endymion Lunar crater (55°N 55°E), 117 km (73 mi) in diameter, with rim components reaching 4500 m (15,000 ft) above its floor. Because it is near the limb, foreshortening makes Endymion appear oblong, though it is actually round. The floor is smooth and dark, having been flooded by lava. This resurfacing has erased most of the inside details, though more recent impacts and ejecta are visible. Because of its age, Endymion has walls that are deeply incised by impact scars. energy Ability of a body to do work (that is, to induce changes to itself or to other bodies). The unit for energy is the joule (J), defined as the work done by a force of one newton moving through a distance of one metre. Energy takes many forms: the energy stored by a bodytem undergoing equal and opposite changes, the increase in entropy during one change would be balanced by the decrease during the other. The entropy would then be the same at the end of the series of changes as it was at the beginning. All real processes, however, are to some extent irreversible, and therefore such a cycle results in the entropy being higher after the changes than before. Thus in any closed system entropy increases (or at best remains constant) with time. The level of disorder of the system, or its ability to do work, likewise increases with time. If the Universe is a closed system, then the increase of entropy with time leads to the idea of the heat death of the universe. In other words, the Universe will eventually become a uniform mix of basic particles at a uniform temperature and with any one part of it being quite indistinguishable from any other. Enceladus A composite Voyager 2 view of Saturn's satellite Enceladus. While heavily cratered in some regions, the surface of Enceladus has also been smoothed over by episodes of cryovolcanism. The energy radiated by stars arises from different processes at different points in their lives. 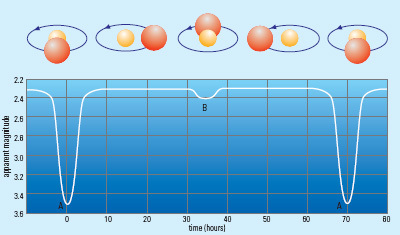 During the formation of a star, gravitational potential energy is being released; throughout most of its active life the energy then comes from nucleosynthesis reactions, while at the end, it is radiating stored thermal energy. Gravitational potential energy is negative since it is clearly zero when two bodies are separated by an infinite distance, and energy is released as they come closer together. For the Universe as a whole it is possible that the total amount of gravitational potential energy balances all other forms of energy so that the net energy of the Universe is zero. English mounting Form of equatorial mounting for telescopes. Ensisheim Meteorite that fell as a shower of stones over Alsace, France, in 1492 November; approximately 127 kg of material was recovered. Ensisheim is an LL-group ordinary chondrite, historically significant because it is the first well-documented meteorite fall. enstatite chondrite (E) Meteorite group that comprises the most reduced of all chondrites. Enstatite chondrites contain abundant iron-nickel metal (up to c.15% by volume), very small chondrules and abundant sulphide minerals. E chondrites are further subdivided into two groups on the basis of their iron content - EH (high iron content) and EL (low iron content). entropy (symbol S) Measure of the energy within a system that is not available to do work. It is also often interpreted as the degree of disorder of a system, for example entropy is lower in a crystal of salt and a drop of pure water, and higher in the less-structured system obtained when the salt crystal is dissolved in the water. Ephemeris Time (ET) Timescale used by astronomers from 1960 until 1984 in computing the predicted positions, or ephemerides, of the Sun, Moon and planets. Because the rotation of the Earth on its axis is not regular, neither mean solar time nor sidereal time are accurate enough for computing the gravitational equations of motion required for ephemerides. Ephemeris Time was based in principle on the Earth's revolution around the Sun, and in practice on the orbital motion of the Moon, since these are less affected by unpredictable forces than is the rotation of the Earth. It therefore provided a timescale that was more uniform in the long term than others but was replaced in 1984 by dynamical time. epicycle In the ptolemaic system and earlier systems, a small circle around which a planet was supposed to move; the centre of the epicycle moved, in turn, on a larger circle, the deferent, centred on the Earth. epoch Date at which a set of orbital elements had the particular values quoted. An orbit is specified by six orbital elements. Five of them define the size, shape and orientation of the orbit, and vary only slowly as a result of perturbations by other bodies. It does not matter much, therefore, if these five elements are used unchanged to compute the position at a time away from the epoch. The sixth element defines the position of the body in the orbit at some particular time. For planets and satellites it is usual to take this element as the value of the mean longitude (or sometimes the mean anomaly) at the epoch of the elements, so clearly this quantity will be very much different at times away from the epoch, and this time difference from epoch has to be taken into account. For comets and newly discovered asteroids the sixth element is taken as the time of perihelion passage. This property of the orbit should be independent of the date (epoch) at which a set of elements is determined. So for this form of elements used for comets and asteroids the epoch of the elements does not have the significance that it does when the sixth element is the mean longitude or mean anomaly. Epsilon Aurigae eclipsing binary star that after more than 150 years of observation and scientific research is still not fully understood. The variability of Epsilon Aurigae was first observed in 1821 by a German pastor, J.M. Fritsch, but it was spectroscopic observations by Hans Ludendorff (1873-1941) at the turn of the 20th century that produced the first significant data. The period is approximately 9892 days, which is the longest known for an eclipsing binary. 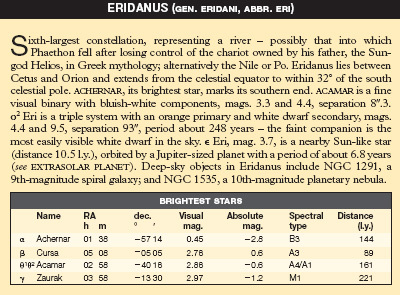 The primary component of Epsilon Aurigae is a luminous supergiant star that exhibits an FO-type spectrum. It is a naked-eye object with apparent magnitude +3.0 at maximum brightness and +4.1 during primary eclipse. Recent reports associate semiregular pulsations with the primary, but it is on the whole not a particularly remarkable star. All the interest in Epsilon Aurigae is associated with the mysterious companion star. The primary F0 spectrum is observed at all phases of the system's revolution (even at primary minimum) and, more surprisingly, no single feature has yet been observed that may be assigned to the secondary. Inconspicuous constellation, the second-smallest of them all, representing a little horse, lying near the celestial equator between Delphinus and Pegasus. Its brightest star, Kitalpha, is mag. 3.9. e (or 1, 'one') Equ is a quadruple star system whose brightest components are both pale yellow, mags. 6.1 and 6.4, separation 0".9, period 101 years. Thus, evidence concerning the nature of the secondary component of Epsilon Aurigae is inconclusive and apparently contradictory. More sophisticated observations have been made and various models proposed in order to explain them. Early models concentrated on the possibility of a secondary component larger than the primary. One idea proposes an object some 3000 times larger than the Sun. It is suggested that the object is cool (perhaps less than 1000 K), emitting strongly at infrared wavelengths but remaining sufficiently dim at optical wavelengths to explain observations. Furthermore, this object would be tenuous and therefore semitransparent, explaining why the primary component spectrum is observed unchanged even during primary eclipse. The major problem facing models of this kind is that such large tenuous bodies are not capable of blocking enough radiation from the primary component during eclipse to reduce the apparent brightness by the observed amount. Infrared photometry of Epsilon Auri-gae in 1964 by Frank Low (1933- ) and R. Mitchell showed no evidence for a cool object of the type envisaged in these models. Earlier, the Italian astronomer Margherita Hack (1922-) proposed a model for Epsilon Aurigae in which a a small secondary component might explain the complete absence of a secondary minimum in the light-curve. If this object were hot and luminous, however, it would be difficult to understand the absence of a secondary contribution to the observed spectrum. Moreover, with a small secondary object there is difficulty once again in explaining the extent to which brightness is reduced during primary eclipse. It is not clear how the secondary component could block so much radiation from the primary and yet not be noticeable as it, in turn, is eclipsed. From detailed analysis of the spectrum of Epsilon Aurigae, Otto Struve pointed out that the primary component seemed to possess an extended atmosphere. This led to interpretations based on the idea of a small dark secondary star and a region of dusty matter situated between the two components. A disk of dust viewed edge-on, for example, could conceivably mask radiation from the primary star to the observed degree. Attention was once again lavished upon Epsilon Auri-gae during the eclipse of 1982-84. Observations suggest that the plane of the occulting disk does not coincide with the binary's orbital plane and that the disk itself is warped. Such a configuration could be sustained if the invisible secondary were actually a pair of white dwarf stars. The problem is unlikely to be resolved before the next eclipse takes place in 2009. Epsilon Bootis See izar equant Point that was introduced by Ptolemy to improve the description of planetary orbits. Viewed from the equant, the centre of the planetary epicycle appears to move around the sky at a uniform rate (see ptolemaic system). equation of time Difference at any point during the year between MEAN SOLAR TIME, as measured by a clock, and APPARENT SOLAR TIME, as shown on a sundial. Because the Sun does not appear to move across the sky at a uniform rate, mean solar time was introduced to provide a uniform civil timescale. On four occasions, April 15, June 14, September 1 and December 25, the difference between it and apparent solar time (and hence the value of the equation of time) is zero; it rises to a maximum of 16 minutes in November. equatorial coordinates Most commonly used system for locating points or celestial objects on the CELESTIAL SPHERE, using the CELESTIAL EQUATOR as the plane of reference and the measures of RIGHT ASCENSION and DECLINATION. Right ascension is measured along the celestial equator in hours, minutes and seconds eastwards from the FIRST POINT OF ARIES, the intersection of the celestial equator with the ECLIPTIC. Declination is measured from 0° to +90° between the celestial equator and the north CELESTIAL POLE, and from 0° to —90° between the celestial equator and the south celestial pole. HOUR ANGLE and POLAR DISTANCE can be used as alternative measures. equatorial mounting Telescope mounting in which one axis, the polar axis, is parallel to Earth's axis of rotation, and the telescope can be moved about the other axis, the declination axis, which is perpendicular to the polar axis. With an equatorial mount, it is possible to track objects across the sky by using a DRIVE mechanism to turn the polar axis at the sidereal rate of one rotation per 23h 56m. Smooth, efficient driving depends on having the telescope carefully balanced by appropriate counterweights to minimize stress on the motor and its gear assembly. equatorial mounting A useful means of mounting a telescope so that it can be driven to follow the apparent motion of the stars due to Earth’s rotation, the equatorial is based around two main axes. 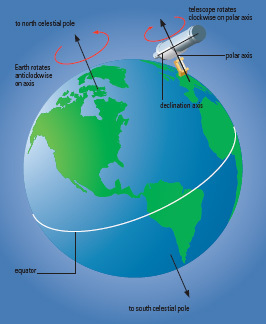 The polar axis, around which the driving motor turns the telescope, is aligned parallel to Earth’s axis of rotation. North and south movement is made along the declination axis. There are a number of variations on the equatorial mounting. In the German mounting (invented by Johann von FRAUNHOFER), the centre of mass of the telescope lies near one end of the declination axis. Medium-sized amateur REFLECTING TELESCOPES are commonly placed on German mountings, which can be quite portable. The main limitation is in access to the sky in the direction of the celestial pole, where the mounting itself may get in the way of the telescope. Another limitation is the transmission of vibrations from the mounting's pier, particularly to smaller, lighter telescopes. An alternative is the English mounting, where a cradle (yoke) aligned with the polar axis holds the telescope, allowing movement in declination on two pivots. A further variation replaces the cradle with a polar-axis bar, to which the telescope is attached at a single pivot. The English equatorial mounting allows greater access to the sky around the pole than does the German mounting. To gain access to the areas of sky below the pole, however, a further variation is necessary. In such horseshoe mountings, the upper part of the polar axis is designed with a gap sufficiently large to accommodate the telescope. Fork mountings are similar to the cradle form of English equatorial, with the telescope held between two arms of a fork aligned with the polar axis. Such mountings are often used for short-tubed SCHMIDT-CASSEGRAIN instruments. Although equatorial mounts were for a long time the standard for large telescopes, developments in computers and automated drive systems have led to modern professional instruments being mounted on ALTAZIMUTH MOUNTINGS. Similarly, many amateur GO TO TELESCOPES are provided with altazimuth mounts. equinox Two instances each year at which the Sun appears to cross the CELESTIAL EQUATOR. The spring or VERNAL EQUINOX occurs around March 21, when the Sun is overhead at the terrestrial equator, crossing from south to north. The AUTUMNAL EQUINOX occurs when it crosses from north to south, around September 23. At the time of the equinoxes, day and night are of equal length all over the world (the word equinox means 'equal night'), the Sun rising due east and setting due west on those days. The term is also used to describe the two points on the CELESTIAL SPHERE where the celestial equator intersects with the ECLIPTIC - the FIRST POINT OF ARIES and the FIRST POINT OF LIBRA. The effects of PRECESSION cause these points to move westwards along the ecliptic at a rate of about one-seventh of an arcsecond per day. The equinox defined for a particular day is known as the true or apparent equinox and the inclusion of leap days into the CALENDAR every four years ensures that the true equinoxes always occur around the same date. equivalence principle Principle stating that the gravitational mass of an object is exactly equal to the inertial mass of the object. Another formulation states that in any enclosed volume of spacetime, one cannot differentiate between an acceleration caused by gravity and one caused by any other force. This principle is one of the pillars upon which GENERAL RELATIVITY is built. Eratosthenes Lunar crater (15°N 11°W), 61 km (38 mi) in diameter, with rim components reaching 4880 m (16,000 ft) above its floor. Eratosthenes is located at the end of the Montes APENNINES. It is a complex crater, with central peaks and side-wall terracing. Its ejecta is overlain by that of COPERNICUS, and its ray pattern has been eroded by micrometeorite bombardment; deeper impressions of its ejecta are still visible at low Sun angles. Eratosthenes also measured the tilt of the Earth's axis of rotation as 23°51'15", and compiled a catalogue of 675 naked-eye stars. His mathematical work led him to develop many essential basic concepts of geometry. In geography he divided the Earth's globe into five zones - a torrid zone bordered by two temperate zones, which in turn were bordered by two frigid regions. He was also a chronologist, being the first Greek scientifically to date historical events; he constructed a calendar that contained leap years. Erfle eyepiece Telescope EYEPIECE designed to have low power and a wide field of view. The design consists of three lenses, at least one of which is a DOUBLET, and it provides an apparent field of view of over 60°. It is named after its inventor, the German optician Heinrich Erfle (1884-1923). Eros First NEAR-EARTH ASTEROID to be discovered, in 1898; number 433. With perihelion at 1.13 AU and aphelion at 1.78 AU, the orbit of Eros encompasses that of Mars, and it is classed as an AMOR ASTEROID. It is likely the second-largest object in that class (after GANYMED). Eros' ability to come fairly close to us makes it a particularly bright asteroid. In 1931 Eros passed within 23 million km (14 million mi) of the Earth, and a global programme of measurements of its position relative to background stars was organized in order to determine its parallax and thus its distance. From this effort an improved determination of the ASTRONOMICAL UNIT was expected, but the value derived was slightly too high. In 1975 another concerted campaign of observations was organized for a subsequent close approach by Eros. eruptive variable Member of a large heterogeneous class of VARIABLE STARS. The class contains many little-understood objects, ranging from SUPERNOVAE, through interacting binary systems, to flare activity on single stars and the ejection of shells of matter by a variety of objects. The complex phenomena in CATACLYSMIC VARIABLE, SYMBIOTIC STAR and NOVA systems (such as rapid variations, large outbursts and X-ray emission) are primarily caused by the effects of orbital motion, varying rates of mass exchange, and thermonuclear burning of hydrogen that the WHITE DWARF (or possibly NEUTRON STAR) in interacting binary systems has acquired from its companion. Related objects include X-ray transients such as A0538-66 in which a neutron star is in a highly eccentric orbit about a hot (B-type) giant. When the outer envelope of the hot star is sufficiently distended, the neutron star passes through it, giving rise to a burst of optical and X-ray radiation. Supernovae owe their outbursts to the rapid release of thermonuclear energy, which leads to the ejection of large amounts of mass and the formation of a neutron star. In the case of Type I supernovae, MASS TRANSFER from a companion to a white dwarf in a binary system may initiate its explosion. UV CETI STARS, for example PROXIMA CENTAURI, are RED DWARF stars showing flare activity (see FLARE STAR). Some red dwarfs, such as BY DRACONIS STARS, show light variations that can be attributed to large starspots (roughly analogous to SUNSPOTS). The rotation of the star carries the spots periodically in and out of view, causing the observed light variations. Starspots are a magnetic phenomenon. Magnetic fields constrain the flow of matter and energy near the stellar surface, and lower temperature regions (the spots) form where the magnetic tubes of force cluster. Some red dwarfs are simultaneously BY Draconis and UV Ceti stars. Starspots are also found on the giant and subgiant components in some CLOSE BINARY systems (the RS CVB stars). TTAURI STARS are very young (pre-MAIN SEQUENCE) objects generally found in regions of recent star formation. They show flaring activity and a strong, variable, chro-mospheric-type emission spectrum. As in UV Ceti stars, such activity is probably caused by the very strong magnetic field produced in a rapidly rotating star. S DORADUS STARS are hot, very luminous, supergiants with dense expanding envelopes. Similar, but somewhat fainter, are the GAMMA CASSIOPEIAE STARS, which often show irregular variability because outflow of matter in their equatorial planes forms disks and rings. R CORONAE BOREALIS variables have evolved past the red-giant stage and have ejected their hydrogen-rich envelopes to expose a carbon-rich, hydrogen-poor core. Their irregular declines in brightness (by up to about 9 magnitudes) are caused by obscuration by clouds of carbon particles, each cloud covering only a limited area of the stellar surface (perhaps about 3%). Declines occur when a cloud is ejected in our line of sight; clouds ejected in other directions can be detected spectroscopically and in the infrared. The process of mass ejection may be related to the pulsations which at least some eruptive variables undergo. escape velocity Minimum velocity that an object, such as a rocket or spacecraft, must attain in order to overcome the gravitational attraction of a larger body and depart on a trajectory that does not bring it back again. It is, in effect, the velocity required to achieve a parabolic orbit, and is given by V(2GM/R), where M is the mass of the larger body, R is the distance from the centre of the larger body, and G the gravitational constant. It is a factor of ^2 larger than the CIRCULAR VELOCITY at the same location. It is the escape velocity at the surface of a body rather than the mass that determines which gases the body is able to retain in its atmosphere. At the surface of the Earth the escape velocity is 11.2 km/s (6.9 mi/s). Eskimo Nebula Bright, bluish planetary nebula in the constellation gemini, a couple of degrees south-east of Delta (RA 07h 29m.2 dec. +20°55'). The nebula has overall magnitude +9.2 and a diameter of 15". Long-exposure photographs give the impression of a face surrounded by a fur hood, hence the nebula's popular name. 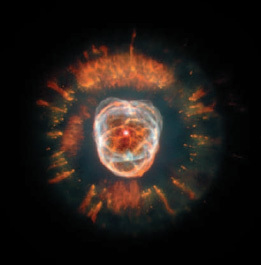 Eskimo Nebula Following its 1999 December refurbishment, the Hubble Space Telescope obtained this extremely detailed image of the planetary nebula NGC 2392. The object is popularly known as the Eskimo Nebula, with the outer parts resembling the furlined hood of a parka in early photographs. ESO Abbreviation of european southern observatory 5.52 years. This suggests that the central object is in fact a binary star system, consisting of two stars of about 80 solar masses orbiting each other at a distance of about 20 AU. The shape of the bipolar nebula may have been caused by the fact that it is a binary system. Eta Carinae Nebula (NGC 3372) emission nebula surrounding the variable star eta carinae (RA 10h 45m.0 dec. -59°50'). It lies at a distance of about 8000 l.y. and subtends an area of 2° X 2° in the southern sky. Lanes of dark dust split the nebula. It shows much structure, including the bright homunculus nebula and dark keyhole nebula. Changes in structure have been observed over timescales of decades. The Eta Cari-nae Nebula is the brightest in the sky, with an apparent integrated magnitude of + 1.0. Eta Geminorum Bright semiregular variable star and eclipsing binary with a range of mag. 3.15 to 3.9 V and a period of 232.9 days. The eclipses recur at intervals of 2938 days. Both components are red giants with M3 spectra. Etamin The star y Draconis, visual mag. 2.24, distance 148 l.y., spectral type K5 III. From observations of this star, the English astronomer James bradley discovered the phenomenon of the aberration of starlight. Its name, which is also spelled Eltanin, comes from al-tinnTn. meaning 'the dragon', the Arabic name of the constellation Draco. Eudoxus of Cnidus (408-355 bc) Greek astronomer and mathematician who developed a cosmology based on its 1999 December refurbishment, the Hubble Space Telescope obtained this extremely detailed image of the planetary nebula NGC 2392. The object is popularly known as the Eskimo Nebula, with the outer parts resembling the fur-lined hood of a parka in early photographs. Eta Aquarids meteor shower with a radiant near the 'Water Jar' asterism in Aquarius. It occurs between April 24 and May 20, with a broad maximum over a couple of days around May 4-5. The shower, with peak zenithal hourly rate (ZHR) as high as 50, is, like October's orionids, produced by debris from Comet 1P/halley. At this encounter, Earth meets the meteor stream at its descending node. Eta Aquarids are swift, at 67 km/s (42 mi/s), and yellowish; they often leave persistent trains. The shower is best seen from southerly latitudes. Eta Carinae One of the most luminous stars in our Galaxy. When the southern stars were catalogued, Eta Carinae was a third-magnitude star, but from 1833 it began to vary irregularly, becoming at its brightest second only to sirius. What makes this performance remarkable is the great distance of the star, which was then unknown but is now recognized to be about 8000 l.y. Since it is obscured by a bright, diffuse nebula (the eta carinae nebula), the star's distance cannot be found with any certainty. At its peak brightness, however, Eta Carinae shone some four million times as brightly as the Sun. The star then faded to just below naked-eye visibility. At the same time, a nebulous patch, called the homunculus, formed and expanded around it. The nebula has a double-lobed structure, with an expansion velocity of about 30 km/s (20 mi/s) near the centre but up to 1000 km/s (600 mi/s) at the outer edge. The total amount of mass in the nebula is about ten times the mass of the Sun. Although optically hidden by the nebula, Eta Carinae is the brightest infrared source in the sky (apart from Solar System objects), which shows that it continues to shine about as brightly to this day as it did last century. The drop in its magnitude was caused by the surrounding nebula, and since the mid-1900s the star has gradually brightened in visual light as the extinction by dust decreases. Like PLATO before him, Eudoxus' cosmology consisted of a system of planets fixed to the surfaces of 'homocen-tric' crystalline spheres rotating on axes passing through the Earth's centre. He adjusted Plato's model to fit better the observed planetary motions by postulating that each of the spheres had its poles set to those of the next sphere, and that the axes of rotation were not fixed in space. Additional spheres were constructed to portray the movements of the planets against the fixed stars and the apparent daily rotation of the stars. In this way he was able to explain the retrograde motions ofJupiter and Saturn, but not of Mars. Although Eudoxus probably considered the homocentric crystalline spheres merely as a mathematical model, ARISTOTLE imagined that they had a physical existence. Euler, Leonhard (1707-83) Swiss mathematician who worked at the Berlin Academy and the St Petersburg Academy of Science, making significant contributions to almost every branch of mathematics. In astronomy, he greatly advanced the partial solution of the THREE-BODY PROBLEM, and developed a theory of the Moon's orbit (1772) that allowed Tobias MAYER to construct his tables of lunar positions. Euler developed formulae for finding the orbits of planets and comets from observations of their positions relative to background stars. His investigations in optics influenced the later development of telescopes. Eureka First MARS-TROJAN ASTEROID to be discovered, in 1990; number 5261. Europa Smallest of the GALILEAN SATELLITES of JUPITER; it is only slightly smaller than Earth's Moon and is thus a substantial world in its own right. It is in orbital RESONANCE with both IO and GANYMEDE, such that for every four complete orbits by Io, Europa makes two orbits and Ganymede one. The resulting TIDAL HEATING makes Europa an active world, and it is a prime target for exploration for extraterrestrial life in a salty ocean inferred to exist below its thin icy shell. In contrast to the more strongly tidally heated (and ice-free) Io, however, no surface changes have been seen to occur on Europa during the era of close-up imaging by VOYAGERS 1 and 2 (1979) and the GALILEO orbiter (1995-2001). Europa A mosaic of images obtained by the Galileo orbiter, showing ‘ice rafts’ on the surface of Jupiter’s satellite Europa. The reddish regions may be associated with internal geological activity, while relatively old ice appears blue. Europa's density, of 2.97 g/cm3, almost puts it in the terrestrial planet league, but its exterior is icy down to a depth of about 100 km (60 mi). It is not known whether the ice is solid throughout, or whether its lower part is liquid, which raises the fascinating possibility of a global ocean sandwiched between the solid ice and the underlying rock. Gravity data from Galileo show that, like Io, Europa has a dense, presumably iron-rich CORE (about 620 km/390 mi in radius) below its rocky MANTLE. Europa has its own magnetic field, but it is unclear whether this is generated by convection within a liquid core or within a salty ocean beneath the ice. Europa has a highly reflective surface with an albedo of about 0.7. Since the 1950s it has been known from spec-troscopic studies that the surface is composed essentially of clean water-ice. More detailed recent observations by Galileo and the HUBBLE SPACE TELESCOPE have revealed regions where the ice appears to be salty; they have also revealed the presence of molecular oxygen (O2) and ozone (O3). The oxygen and ozone are thought to result from the breakdown of water molecules in the ice by exposure to solar ultraviolet radiation and charged particles from the SOLAR WIND. Hydrogen thus liberated would escape rapidly into space, as has been observed on Ganymede though not on Europa. It is not known whether the oxygen and ozone detected on Europa constitute an extremely tenuous atmosphere or whether they are mainly trapped within the ice. Europa's surface is relatively smooth and much younger than that of other icy satellites, to judge from the paucity of impact craters. This paucity demonstrates that Europa experiences a rapid rate of resurfacing, driven by tidal heating, though it is not so rapid as on Io. Neither of the Voyager probes passed close to Europa, so even the best Voyager images revealed few features smaller than a few hundred metres across. They were adequate, however, to show a bright surface with low topographic relief, criss-crossed by a complex pattern of cracks filled by darker ice. There are several places where the pattern of these bright plains becomes blotchy, and these were dubbed 'mottled terrain' by the Voyager investigators. The high-resolution images sent back by Galileo show that the bright plains are amazingly complex in detail, being composed of multiple families of straight or slightly curved ridges, each usually bearing a central groove. The appearance of these parts of Europa has been described as resembling the surface of a ball of string, a graphic description that casts no light on how the surface was created. Each grooved ridge probably represents a fissure, where some kind of icy lava was erupted during an episode of CRYOVOLCANISM. Although by far the most abundant component in Europa's ice is water, it is likely to be contaminated by various salts (such as sulphates, carbonates and chlorides of magnesium, sodium and potassium) and possibly by sulphuric acid, resulting from chemical reactions between water and the underlying rock. Contaminants such as these could make any melt liberated from the ice behave in a much more viscous manner than pure water. If erupted as a liquid, this type of lava would not necessarily spread far before congealing, especially if confined by a chilled skin of the sort likely to form upon exposure to the vacuum of space. Contaminants also allow the ice to begin to melt at a much lower temperature than pure water-ice: salts can depress the melting temperature by a few degrees, and sulphuric acid by as much as 55 K.
Europa's ridges are perhaps highly viscous cryovol-canic flows fed from lengthwise fissures. Alternatively, rather than flowing across the ground, the cryovolcanic lava could have been flung up from the fissure in semi-molten clods by mild explosive activity and fallen back to coalesce as a rampart on either side of the fissure. Each fissuring event must represent the opening of an extensional fracture in the crust. This cannot happen across an entire planetary body unless the globe is expanding, which seems highly unlikely. There must, therefore, be some regions on Europa where the surface has been destroyed at a rate sufficient to match the crustal extension elsewhere. Galileo images revealed likely candidates for such regions in some of the mottled terrain imaged by Voyager. Here, in regions such as Conamara Chaos, the crust has been broken into 'rafts' that have drifted apart, maybe because an underlying liquid ocean broke through to the surface. The areas between rafts are a random jumble reminiscent of refrozen sea-ice on Earth. Some rafts can be fitted back together, but many pieces of the 'jigsaw puzzle' seem to be missing, having perhaps been sunk or dragged down beneath the surface. Other regions of mottled terrain are not totally disrupted into chaos, but instead contain a scattering of domes up to 15 km (9 mi) across; these were perhaps caused by 'pods' of molten or semi-fluid low-density material rising towards the surface. In some cases the upwelling pod has ruptured the surface to form a miniature chaos region bearing raftlets of surviving crust. Although little is understood about the processes that have shaped Europa's surface, it is clear that the satellite has had a complicated history. We cannot tell how old each region of the surface is, but there are abundant signs that there is, or at least has been, a liquid zone below the surface. A salty ocean below several kilometres of ice is not necessarily a hostile environment for life. Indeed, life could be richer and more complex than anything that is likely to have survived on Mars. In the depths of Earth's oceans are living communities that are independent of photosynthetic plants and depend instead on bacteria that feed on the chemical energy supplied by springs of hot water (hydrothermal vents). Since Europa is tidally heated, perhaps water is drawn down into the rocky mantle, where it becomes heated, dissolves chemicals out of the rock and emerges at hydrothermal vents that are surrounded by life. The possibility of a life-bearing ocean below the ice has set the agenda for the future exploration of Europa, beginning with NASA's proposed EUROPA ORBITER mission. Europa Orbiter NASA spacecraft that may be launched in about 2005 to EUROPA, the fourth-largest satellite of JUPITER and one that has gained the rank of the highest priority target since the discovery of a possible subsurface ocean beneath a sheet of ice from data and images collected by the GALILEO orbiter. Internal heating may be melting the relatively young and thin 1-km (3300-ft) ice pack, forming an ocean of water underneath. NASA's proposed Europa Orbiter mission (scheduled to orbit Europa from about 2007 to 2009) has the primary goal of verifying the existence of an ocean below the ice. It will identify places where the ice is thin enough for future landing missions to send robotic submarines -'hydrobots' - through the ice to hunt for hot springs and their attendant life. It will achieve this by using an altimeter to determine the height of the tide raised on Europa by Jupiter. The tide should be only 1m (3 ft) if the ice is solid throughout, but about 30 m (100 ft) if there is 10 km (6 mi) of ice overlying a global ocean. It will also use ice-penetrating radar to map ice thickness. High-resolution conventional images will identify sites of recent eruptions. European Southern Observatory (ESO) Major astronomical institution supported by ten European nations, founded in 1962 to operate world-class astronomical facilities in the southern hemisphere and to further international collaboration in astronomy. The partner countries are Belgium, Denmark, France, Germany, Italy, the Netherlands, Portugal, Sweden, Switzerland and, since 2002, the UK. ESO operates two high-altitude sites in the Atacama desert in northern Chile. They are the LA SILLA OBSERVATORY - location of several optical telescopes with diameters up to 3.6 m (141 in. ), together with a 15-m (49-ft) submillimetre radio telescope - and the PARANAL OBSERVATORY, home of the VERY LARGE TELESCOPE. At the organization's headquarters in Garching, near Munich, technical development programmes are carried out to provide the Chilean facilities with advanced instrumentation, and there is also an astronomical DATA CENTRE. European Space Agency (ESA) Principal European space organization whose programme includes launchers, space science, telecommunications, Earth observation and manned spaceflight. It began work in 1975, two years after ten European countries had agreed to combine the aims of the European Launcher Development Organisation (ELDO) and the European Space Research Organisation (ESRO) in a single agency. Today, ESA has 15 member states in Europe and includes Canada as a Cooperating State. It has laboratories throughout Europe and overseas. Its headquarters are in Paris, while its Space Operations Centre (ESOC) is at Darmstadt in Germany. The European Space Research and Technology Centre (ESTEC) is ESA's biggest establishment, situated at Noordwijk in the Netherlands. ESA's early years were spent regaining ground lost by the failure of its predecessors to develop a European launch vehicle. A turning point came in 1986 with the outstanding success of the agency's GIOTTO spacecraft, which was launched on a European rocket. Since then, ESA has become a major player in the space industry. Its ARIANE rockets now command the global market in space launches, especially for communications satellites. It has developed some of the world's most advanced telecommunications and Earth-monitoring satellites, and is a full partner in the INTERNATIONAL SPACE STATION, building on the achievements of ESA astronauts on MIR and the SPACE SHUTTLE. The agency is a partner with the NATIONAL AERONAUTICS AND SPACE ADMINISTRATION (NASA) in high-profile space projects such as the HUBBLE SPACE TELESCOPE and the SOHO solar observatory, and the Huygens lander for the cassini mission. In the future, the ESA mars express (2003) will carry out the most detailed scrutiny of Mars yet attempted, while the herschel space observatory and planck surveyor will map the skies from 2007. European VLBI Network (EVN) Powerful interferometric array of radio telescopes across Europe and beyond, formed in 1980. The network consists of 18 individual instruments, among them some of the largest and most sensitive radio telescopes in the world, such as the lovell telescope and the Effelsberg Radio Telescope. The EVN is administered by the European Consortium for VLBI (see very long baseline interferometry), and incorporates 14 major institutes. evection Largest periodic perturbation of the Moon's longitude, caused by the Sun, displacing it from its mean position by ±1°16'26".4 with a period of 31.812 days. This perturbation was discovered by ptolemy around ad 140. Prior to this the knowledge of the Moon's orbit was limited to the discovery of the eccentricity of the orbit and the rotation of the line of apsides by hipparchus in around 140 bc. In the years following Ptolemy, various refinements to this model of the evection were proposed, but no further major improvement in the knowledge of the Moon's orbit was made until the discovery of the variation by Tycho brahe in around ad 1580.
evening star Another name for the planets venus or mercury when either appears, following superior conjunction, as a bright object in the western sky after sunset. Because of its appearance in both the evening and morning skies, at different times, the ancient Greeks thought Venus was two separate objects: an evening star, which they named Hesperus, and a morning star, which they called Phosphorus. Mercury under the same circumstances was known as Hermes (evening star) and Apollo (morning star). event horizon Boundary of a black hole beyond which no information is available because no form of radiation can escape. It is the point at which the escape velocity of the object becomes equal to the speed of light. In a non-rotating black hole with no charge, the event horizon is equal to the schwarzschild radius. Evershed, John (1864-1956) English astronomer who in 1908 discovered radial motions of gases in sunspots, now known as the evershed effect. Originally an amateur astronomer who distinguished himself by discoveries made with home-made equipment on expeditions to observe total solar eclipses, Evershed was a founding member of the British Astronomical Association (1890) and directed its solar and spectroscopic sections. He designed a high-dispersion solar spectrograph using large liquid prisms as the dispersive element, and was able to discover new spectral lines in the Sun's corona. He also made major contributions to the study of cometary structure, using spectroscopy to show that their nuclei contain high concentrations of cyanogens. Evershed effect Radial, outwards flow of gases in the penumbra of sunspots at the level of the photosphere. It was discovered in 1908 by John Evershed from the doppler effect of lines in the spectra of sunspots. The mean flow velocity is 2 km/s (1.2 mi/s). At higher levels in the solar atmosphere, the flow is inwards and downwards, and of higher velocity (around 20 km/s or 12 mi/s). exit pupil For a telescope, the image of the primary mirror or lens as seen through the eyepiece. The point at which this image is formed is the optimum position for the observer's eye, so for comfort it should not be too close to the eyepiece itself (see eye relief). For any eyepiece-telescope combination, the size of the exit pupil can be found by dividing the eyepiece's focal length by the focal ratio of the telescope. On an ^8 instrument, for example, a 24-mm eyepiece will have an exit pupil of 3 mm. Ideally, to deliver most light, the exit pupil should be around 7 mm, equivalent to the maximum pupillary dilation of the dark-adapted eye (see dark adaptation). exosphere Outermost region of a planetary atmosphere, from which atoms and molecules may escape into interplanetary space. The pressure of an atmospheric layer decreases with increasing altitude so that, eventually, the atmosphere is so thin that the collisions between the gaseous species become very infrequent. (That is, the mean free path becomes extremely long.) Ultimately, there is a level at which there are no collisions; the fast-moving atmospheric constituents may then escape the gravitational influence of the planet altogether or perhaps go into orbit around it. For the Earth's atmosphere, this region begins at an altitude of 200-700 km (120—130 mi), depending on the degree of solar activity. The exosphere, therefore, overlaps with the outermost part of the thermosphere, but includes the radiation belts and extends to the magnetopause, where it meets the interplanetary medium. expanding universe Outward movement (redshift) of galaxies. That the Universe is expanding was first demonstrated observationally in 1929 by Edwin hubble, although the possibility had been suggested earlier on theoretical grounds by Willem de Sitter (1917), Aleksandr Friedmann (1922) and Georges Lemaitre (1927). The evidence Hubble found was that if he took a spectrum of a galaxy, the spectral lines would always be redshifted by an amount proportional to the distance he estimated for the galaxy. This relationship is commonly called the hubble law. For distant galaxies, this expansion velocity is an appreciable portion of the speed of light. Recessional velocities of this magnitude would be difficult to understand if the galaxies were moving through space, but make perfect sense if the Universe itself were expanding. general relativity interprets this expansion as the expansion of spacetime itself, and even predicts that it should obey a linear law such as the Hubble law. If this expansion is extrapolated backwards until spacetime was a singular point, then the age of the Universe can be estimated. These ideas set the stage for the big bang theory. Predictions made from these ideas include the temperature of the cosmic microwave background and the cosmic abundance. Explorer Series of small US scientific satellites, mostly launched into Earth orbit. Explorer 1, instrumented by James van allen, discovered in 1958 the radiation belts girdling the Earth. Of the 72 successful Explorer missions launched by the end of 2000, five had operated for 10 years or more. 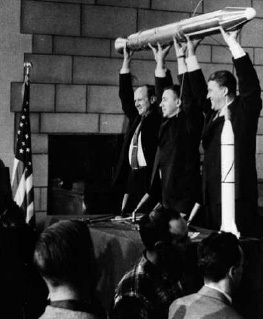 Explorer Seen here with a model of Explorer 1 are Dr William H. Pickering, Dr James A. van Allen and Dr Wernher von Braun. Explorer 1 was America’s first successful artificial satellite. extinction Loss of light from the line of sight as it passes through a medium. The loss may be by scattering, in which case the light energy is taken up by the medium and promptly re-emitted at the same energy but redirected out of the line of sight. Or the loss may be by absorption, in which case the light energy is eventually re-emitted in a different form altogether, for example as heat. Typical examples of extinction in astronomy are the loss of starlight as it passes through the interstellar medium and is scattered and absorbed by interstellar grains, and the loss of starlight as it passes through the Earth's atmosphere and is scattered by air molecules. extrasolar planet (exoplanet) Planet not associated with our Solar System. The existence of other worlds, especially inhabited ones, has been the subject of debate since ancient times. In the 20th century, stars with irregular proper motions were suspected of having planetary companions; barnard'sstar was a famous candidate. In 1992, after centuries of speculation and decades of false announcements, Dale Andrew Frail (1961- ) and D. Wolszcan detected the first extrasolar planets, orbiting the pulsar PSR 1257 + 12.In 1995 October, Michel Mayor (1942- ) and Didier Queloz (1966- ) found the first undisputed instance of a planet orbiting another main-sequence star, 51 Pegasi. By late 2001, about 85 planetary systems had been discovered around a wide diversity of stars up to 180 l.y. 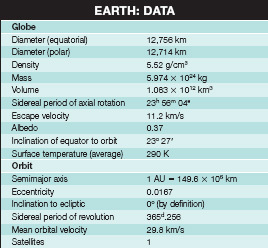 away; the table gives orbital parameters for ones of particular interest. Many of these substellar objects are in very close orbits and are many times the mass of Jupiter. The lower theoretical mass limit for a brown dwarf is about 0.013 solar mass, which is approximately 13 Jupiter masses (13 Mj); by convention, this is taken as the upper mass limit for a giant planet. 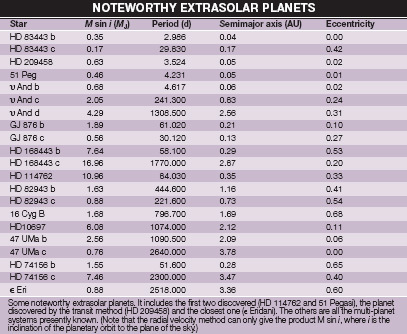 extrasolar planet The 50 m/s periodic variation of the radial velocity of 51 Pegasi. One cycle takes 4.23 days – the orbital period of the planet, which has a mass of 0.47 MJ. There are now ten times as many planets known to orbit other stars than there are major planets in our Solar System. Taking into account stars with no detectable planets, about 5% of main-sequence stars appear to have a giant planet orbiting at less than 2 AU. The first extrasolar giant planets were found 100 times closer to their parent star than expected. In standard models of planetary formation, Jupiter-sized planets form at a distance of 4-5 AU from solar-type stars. The very close orbits can be explained by a process known as orbital migration. Half the planets have orbits with unexpectedly large eccentricities. These could result from migration: if two planets are migrating inwards at different rates, one could expel the other from the system and have its own orbit perturbed. There are three methods of detecting extrasolar planets. 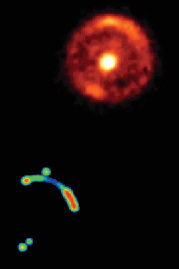 Direct imaging is possible in principle, either by a planet's reflected light from the parent star or by its infrared emission. But such reflected light or infrared radiation is extremely faint, and because the planet is extremely close to the star, it is very difficult to separate them; also, the image of the planet lies within the airy disk of the star as seen through a telescope. There are two ways round this difficulty: reduce the size of the Airy disk so that the planet is outside it, or block the starlight. Shrinking the Airy disk would require a telescope with an aperture of 10-100 m (33-330 ft) or a multi-aperture interferometer, preferably in Earth orbit. Starlight can be blocked by a coronagraph, a physical obstruction at the telescope's focus, or by a technique in which the star's light is made to interfere destructively with itself without affecting the region around it. The second method is to search for the planet's gravitational perturbation of its parent star. Both planet and star orbit their common centre of mass, and the small periodic change in the star's proper motion is apparent in its radial velocity (a doppler effect) and position on the sky. If the planet's orbital plane coincides with our line or sight, the variation of radial velocity is greatest. Radial velocity and position vary cyclically with a period equal to the planet's orbital period and an amplitude proportional to the planet's mass. The precision in radial velocity measurements is presently 3 m/s, which would enable the detection of planets similar in mass to Saturn. But there is no hope yet of detecting an Earth-like planet since it would give rise to a variation in the star's radial velocity of just 0.1 m/s. The third method of detection is by transits: if a planet crosses the face of its sun, it can produce, under favourable circumstances, a small drop for a few hours in the star's light. The depth of the drop is given by the star-to-planet surface ratio: 1% for a jupiter, 0.01% for an earth. The planet's orbital plane must be favourably oriented: the probability that an orbit is sufficiently close to edge-on is 0.5% for a planet 1 AU from its star and decreases (increases) with increasing (decreasing) distance. Jupiter-size planets can be detected in this way from the ground, and Earth-sized planets could be detected from space. The transit method was used to measure the radius of the planet orbiting the star HD 209458. The planet has a mass of 0.6 MJ and its radius is 30% larger than Jupiter. In 2000 the Hubble Space Telescope (HST) detected absorption lines from the planet's atmosphere during a transit that indicated the presence of sodium - the first indirect detection of an atmospheric component of an extrasolar planet. The search for extrasolar planets is being stepped up, with many projects in the pipeline or under study. Astro-metric space missions include NASA's Space Interfero-metric Mission (SIM), due for launch in 2009, and ESA's GAIA project. The planned 2009 launch of the NEXT GENERATION SPACE TELESCOPE will increase the potential for discovery. Interferometric missions aimed at detecting Earth-like planets have been motivated by the search for LIFE IN THE UNIVERSE. They include ESA's Darwin, consisting in its initial configuration of five orbiting 1.5-m (60-in.) telescopes separated by 20-100 m (65-330 ft), and NASA's Terrestrial Planet Finder (TPF). COROT is an ESA/CNES mission to be launched in 2004 to detect planetary transits. Its 250-mm (12-in.) aperture telescope should be able to detect tens of planets down to twice the Earth's radius, some of which should orbit within the ECOSPHERE of their parent star. NASA's Kepler project, due for launch in 2007, has a 1-m (40-in.) telescope that will view 100 square degrees of sky at a time and should be able to detect a few hundred Earth-like planets in stellar ecospheres. Finally, there is some evidence that not all extrasolar planets are orbiting stars: high-resolution infrared images of star-forming regions suggest the existence of what are called unbound or free-floating planets. extreme-ultraviolet Vaguely defined wavelength band that extends roughly from the end of the soft (low-energy) X-ray band near 10 nm to the edge of the FAR-ULTRAVIOLET near 75 nm. Extreme Ultraviolet Explorer (EUVE) NASA spacecraft launched in 1992 to carry out a full-sky survey at EXTREME-ULTRAVIOLET wavelengths - a region of the spectrum not covered by previous satellites. It carried three EUV telescopes, each sensitive to a different wavelength band. A fourth telescope performed a high-sensitivity search over a limited part of the sky in a single EUV band. Its mission ended in 2000 December. eyepiece (ocular) System of lenses in an optical instrument through which the observer views the image. The eyepiece is usually a composite LENS that magnifies the final real image produced by the optics. There are many different designs of eyepiece, all attempting to achieve the best result for a particular application. Most incorporate an eye lens that is closest to the eye and a field lens that is closest to the OBJECTIVE. The magnification provided by a telescope is calculated by dividing its focal length by the focal length of the eyepiece used with it. Thus the magnification can be changed simply by changing the eyepiece; astronomical eyepieces come in standard sizes with a simple push-fit to facilitate this. Standard sizes are 0.965 inch (24 mm), 1.25 inch (31 mm) and 2 inch (51 mm), with 1.25 inch by far the commonest. When an eyepiece with a shorter focal length is used and the overall magnification increases, the field of view -the area of sky the observer can see - will decrease. However, some eyepiece designs provide a larger field of view than others, and manufacturers often quote an apparent field of view determined by the acceptance angle of the eyepiece, which is typically around 40°. The telescopic field of view is the acceptance angle of the eyepiece divided by the magnification. Wide-angle eyepieces can be designed to have acceptance angles up to 80°, but this additional width comes at the cost of increased distortion, particularly towards the edges of the field. Если клиент желает, на бумажные контрольные браслеты нанесем любую символику.